LORAC TANtalizer® To Glow Go Collection. Faking a bronze and staying safe in the sun with makeup can be easy, if you have the right makeup. This collection of products from LORAC Cosmetics has everything you need to get a beachy, bronzed look, all in this set. TANtalize Me Baked Bronzer is a beautiful bronzer that is swirled with multi-shades of bronze for the perfect, easy glow. Baked on terra cotta, the bronzer feels like silk as it goes on the skin. TANtalizer® Lips With Benefits Lip Gloss in Rico is a beautiful soft bronzed rose shade that gives off the right amount of gloss, bronzed gold and rose all mixed together. The three eye shadows are a perfect accent to a tan. They are silky soft and blend with ease. When going for an easy bronzed look, I simply sweep Barbados Bronze all over my eyes, and just highlight the inner corner and top of my brow bone with Tahitian Sand. I then take Costa Rican Coffee and use it with an eyeliner brush as my liner. TANtalizer Body Bronzing Luminizer is a great instant tanner that deepens a glow or adds one to the skin. I like this to deepen the faux glow on my legs. I've used this for years and buy a tube every summer. Having this in the kit is a bonus. 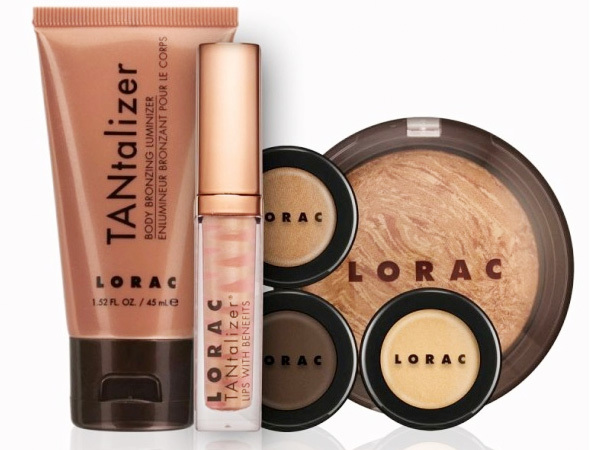 The LORAC TANtalizer® To Glow Go Collection sells for just $36.00 (if sold separately, they would cost over $120!) at Sephora, loraccosmetics.com and beauty.com.